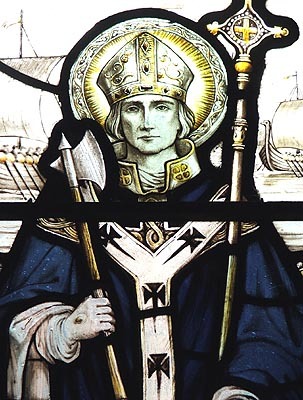 St. Alphege, or more properly Aelfheah, was, traditionally, born of a noble family in Weston near Bath (Somerset), about the year AD 953. While he was still very young, he renounced the World and, notwithstanding the tears and entreaties of his widowed mother, retired into the monastery of Deerhurst, in Gloucestershire, where he served God with great devotion for many years. After a time, he moved on to Glastonbury, where he became Prior. Afterwards, wishing to lead a life of greater seclusion and austerity, he lived as an anchorite near the hot springs in Bath. Here, he was followed by many of his former disciples until St. Dunstan, who was then primate of all England, persuaded him to become Abbot of the community of secular canons living nearby. On the death of Aethelwold, Bishop of Winchester, in AD 984, the latter, further, called on St. Alphege to take up the vacant dignity. England was, at this time, a continual prey to the marauding Vikings. King Aethelred the Unready had recourse to repeated bribes, with which he hoped to purchase relief from their attacks; but Alphege sought to win them by the power of the Gospel. In AD 994, Olaf Tryggyeson, King of Norway, and his men attacked London. The citizens bravely beat him off and he moved on to ravage the south coast, wintering at Southampton. King Aethelred the sent Alphege and the Ealdorman, Ethelward, to visit Olaf there and request him to confer with the English King; and they brought the Norwegian to Andover, where Aethelred was then residing. Olaf was a Christian, but he was unconfirmed. So Alphege persuaded him to enter into a peace whereby he would confirm Olaf and King Aethelred adopt him as his son. In return, Olaf promised that he would never invade England again; and he kept his promise faithfully. After governing the See of Winchester for twenty-two years, Alphege was translated to that of Canterbury, on the death of Archbishop Aelfric in 1005. He was present at the Council of Enham, at which he inspired measures to be taken for the national defence. Not a moment too soon; for, only two years into his Archiepiscopate, Viking invasions began once more. A Danish fleet came to England, in two divisions. The first was commanded by Earl Thorkell, the second by his brothers Heming and Eglaf. From this time till the end of Aethelred's reign, the Danish ravages were unceasing. In 1011, the Danes took Canterbury, which was betrayed to them by Alfmar, the Abbot of St. Augustine's, whose life had once been saved by Archbishop Alphege. The Danes are said to have committed every sort of cruelty, the city was plundered and the cathedral burnt. They took many prisoners mostly to sell as slaves. Amongst them was Archbishop Alphege, who had remained at his post to reassure his people. He was kept in captivity, in the Danish base at Greenwich, for seven months in hope of a ransom. When, in April the following year, the Witan met in London and agreed to pay the Danes £84,000 in Danegeld in order persuade them to leave. However, the Archbishop refused to burden the country further by allowing them to pay his extra £3,000 ransom. His captors got drunk one night and, angry at his defiance, they pelted the poor man with ox-bones. Their leader, Earl Thorkell, tried to save him, but his men were uncontrollable The dying Archbishop was finally put out of his misery through a blow from an axe wielded by a sympathetic Dane, named Thrum, whom he had converted whilst a prisoner. The murder took place where the current parish church of St. Alphege now stands in Greenwich. He lay there for several days, the Viking warriors refusing him a descent burial. However, when a dead stick, which had become anointed with his blood, grew green again and began to blossom - a power attributed to the pagan goddess, Dia Feronia - they relented and carried St. Alphege's body to London. Here, Bishops Ednoth of Dorchester and Elfhun of London buried him in St. Paul's Cathedral. By his countrymen, Alphege was justly esteemed a martyr and pilgrims flocked to his side. In 1023 however, London lost its most holy of relics. King Canute the Dane was prevailed upon by his pious queen, Emma, to make amends for the cruelty and sacrilege which the followers of his father had committed in England. He removed the body of St. Alphege to Canterbury Cathedral, where it was laid in a noble tomb, near the high altar, and the cathedral was enriched by many costly gifts from the King and Queen. His principal feast is the date of his death, 19th of April; but his translation is also celebrated on 8th June. He is represented in art as an Archbishop, sometimes with an axe cleaving his skull.